Visiting Target today, I realized that we've reached the point during summer when stores start promoting back-to-school items. Never mind that it's not even August! It's also that time of the summer when the networks to begin pushing their new comedies and dramas for the upcoming fall season. 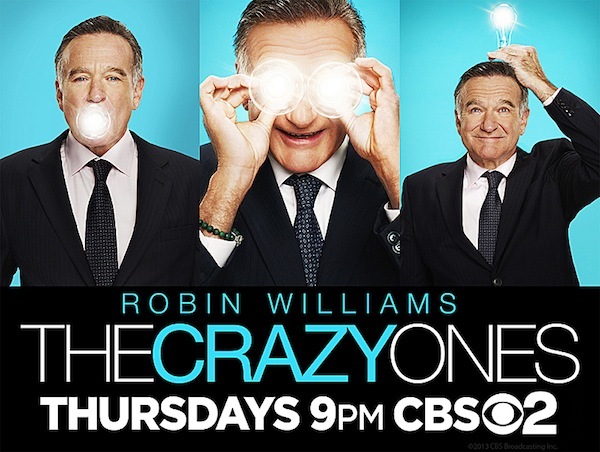 CBS released new key art for their comedies, showcasing the wealth of talent among them, with the faces of Robin Williams, Will Arnett, Margo Martindale, Allison Janney, Anna Faris, Beau Bridges, Kal Penn, Tony Shalhoub, Chris Smith and Jerry O'Connell. Who needs undiscovered talent when there's tried and true talent out there available for starring roles? So, we get Williams' face three times here, and his name once at the bottom, but where's Sarah Michelle Gellar? Not a mention. In The Crazy Ones, Gellar and Williams play father and daughter working together at an Ad agency and attempting to get along despite having opposite personalities. Judging by the lightbulbs, I'd say Dad is the one with all of the ideas. Next up is new Monday-night comedy Mom, which stars Anna Faris and Allison Janney, both of whom might represent the title, as both are mothers; Janney to Faris and Faris to the two children she's trying to raise. Mom comes from Chuck Lorre, who has a pretty stellar track record at CBS, with Two and a Half Men and The Big Bang Theory both serving the network well in the ratings. Looks like they went a little overboard with the touch-ups on this one, as both are looking very smoothed out. Not that Janney isn't stunning in a snapshot, but she almost doesn't look like herself here. I'd say the same for Faris, but there's really no mistaking those giant blue eyes. The Millers stars Bridges and Martindale as the parents of Will Arnett's character. Arnett's Nathan is recently divorced and finds himself dealing with his parents own marital issues as they decide to split up. 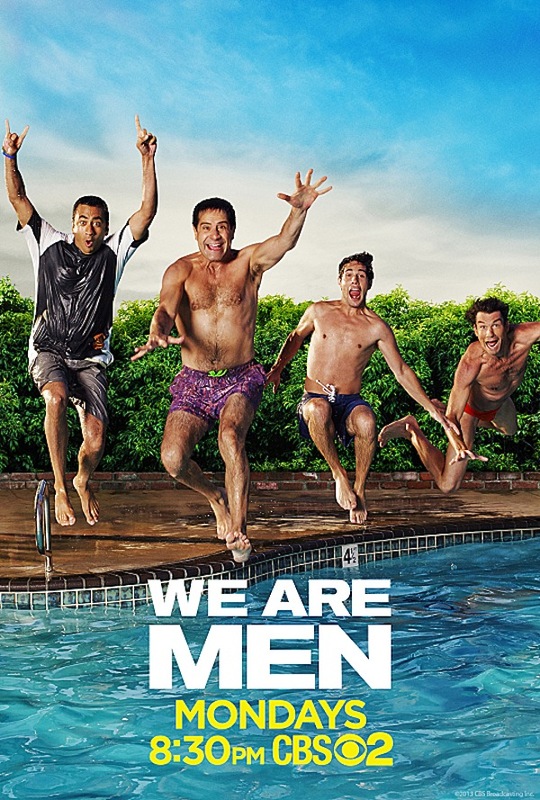 Names are left off this one as well, but from left to right, the men jumping into the pool are Kal Penn, Tony Shalhoub, Chris Smith and Jerry O'Connell. The four men play single guys, each of whom is living in a short-term apartment complex where they're all dealing with various romantic struggles. They may claim to be men, but their group leap into the pool suggests some kid spirit among this group.